I love when I can showcase a local artist! 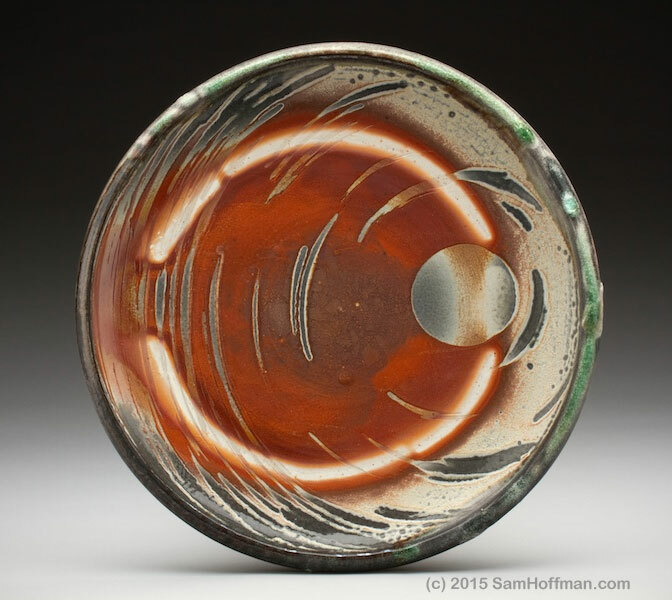 Corvallis potter, Sam Hoffman, created this spectacular wood fire porcelain plate that radiates the eternal essence of mandala energy. To me, the curved lines look like dolphins swimming around the moon…with the deep heat of the sun’s energy pulsating in the background. I am interested more in artistic exploration than expression; my work is primarily motivated by curiosity about the nature of clay and fire. My passion for ceramics is influenced by a background in mathematics, chemistry, and astronomy. I find the scientific method of inquiry useful when experimenting with materials and firings. But I also employ risk and chance as allies in my creative process, an artistic balance that lies somewhere between alchemy and science. Check out his amazing creations on the Gallery page of his web site. Sam’s art reminds us to be explorers when it comes to expressing ourselves in a creative way. Take chances…see what happens when we mix things up, try new methods, or experiment with new materials. Be willing to make mistakes in order to experience new creative endeavors.